The Embedded PCs CX1020 and CX1030 extend the CX product family by versions with higher CPU performance and enable the direct connection of Bus Terminals and EtherCAT Terminals. The CX1020 is equipped with a 1 GHz Intel Celeron M CPU. It is an energy-saving device that operates with ultra-low core voltage and features low thermal power dissipation of only 7 W TDP (thermal design power). As a result, no fan is required despite the compact design of the CX1020 Embedded PC. Since Compact Flash is used as boot and memory medium, no rotating media are required in the controller. This is an important aspect for increasing the MTBF (mean time between failures) of the overall system. The CX1030 is equipped with a 1.8 GHz Intel Pentium M and is the most powerful device in the Embedded PC range. Apart from the cartridge (which is required due to the higher performance) and the CPU, the CX1030 and CX1020 feature identical hardware and software. The high-quality fan is supported by dual ball bearings and mounted in a tray so that it can be replaced in the field without tools or wiring, if required. The fan speed is monitored and can be queried via software. The combination of CX1030, EtherCAT and TwinCAT enables very fast control processes in the sub-millisecond range (eXtreme Fast Control Technology). The basic CPU modules are equipped with two RJ45 sockets and an integrated 3-port switch as standard. In practice, this often means that no separate switch is required, since a line topology can be configured conveniently: for example in building installations, where several room controls can be distributed across each floor, which otherwise would have to be networked via a star topology. The modules of the CX series system are connected with each other via the standardised PC/104 bus (16 bit). The individual system components are modules with a width of 19 mm (single) or 38 mm (double) that can be arranged in series. The basic unit consists of a CPU module CX1020/CX1030 and a power supply module (CX1100-00xx). The CPU module is available in several variants, e.g. 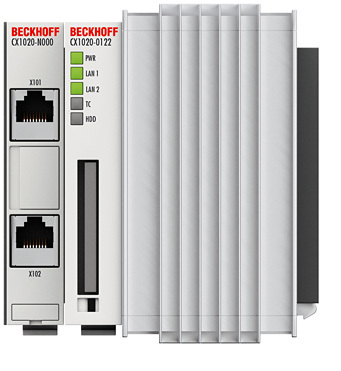 : System interfaces: in addition to the two existing Ethernet ports, further interfaces can be integrated as an option. A DVI-I (= DVI-D + VGA) output, two USB 2.0 interfaces, up to four RS232 interfaces and audio are available. The four RS232 interfaces feature opto-decoupling and can be implemented in pairs as RS422/RS485. operating system: Microsoft Windows Embedded CE 6 or Microsoft Windows Embedded Standard TwinCAT software (pre-installed): without a TwinCAT system, with TwinCAT CE PLC, TwinCAT CE NC PTP, or with the associated full version of the individual TwinCAT levels for PLC, NC PTP and NC interpolation The range of optional modules is complemented by fieldbus connections for PROFIBUS, CANopen, DeviceNet, SERCOS interface and Lightbus, both as master or slave versions.